A lot of people piss on post rock, and I don’t understand why. Okay, I do understand why, but not all post rock bands offer the same thing. Some are more laid back while others are explosive. Some stay in the post rock pocket and some venture into different genres and sound. The key to finding and enjoying good post rock is the setting in which you listen to it. Where and how you listen to post rock can drastically change how you feel about it. Now I’m going to be straight up for a second: writing about post rock is extremely challenging and I often avoid it. The reasons why aren’t important, but what is important is how this album review is going to go. 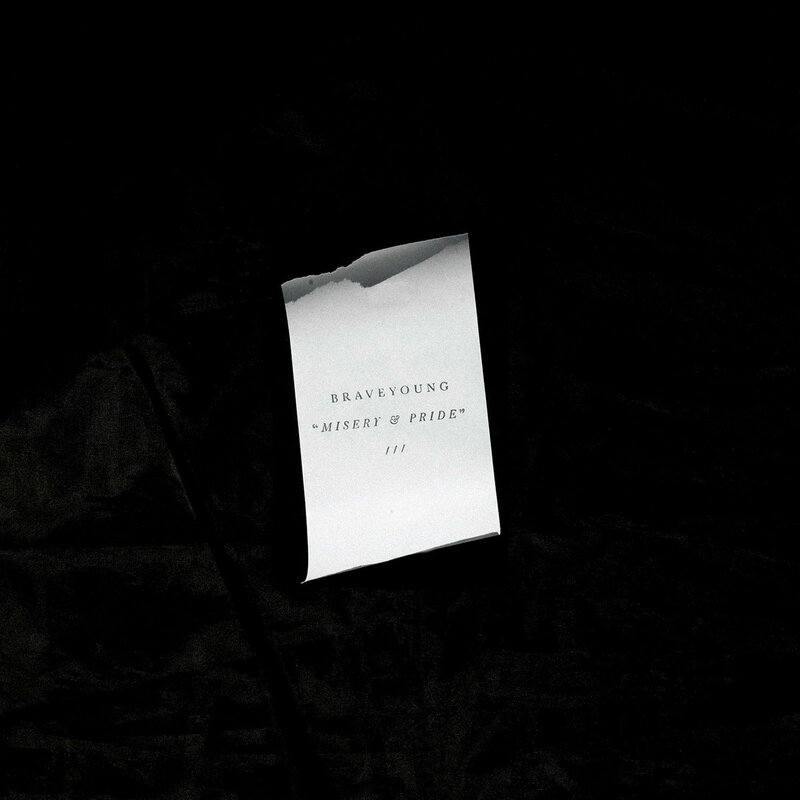 Instead of redundantly describing the stunning atmosphere and deep, brooding emotion found all over Braveyoung’s new album, Misery and Pride, we’re going to run through some situations where I’ve listened to the album and see how it sounded in that setting. Braveyoung formed in the early 2000s’ under the name Giant. When they ditched the Giant moniker, they began moving away from a heavier post metal sound and into softer post rock territory, and they’ve stuck with this sound ever since. We Are Lonely Animals, their first full release, showed the skill these three musicians possess. Since then, they’ve released EP’s and singles that echo this same eerie softness. Misery and Pride is even more ethereal than their last releases, and it’s definitely noticeable. They’ve shied away from the quiet-loud-quiet dynamic and used minimalism to create a beautifully delicate album. Keeping that in mind, let’s look at two places I’ve listen to this album and how it’s worked out. Okay, so technically it wasn’t a road trip, but I was driving long enough to listen to the entire album on one car ride. This is where I found the most meaning listening to Misery and Pride, because when you’re on a long drive, you can sit back and seriously pay attention to the music (and the road at the same time, hopefully). What I really noticed about this album on my road trip was how strong yet minimal it was. For example, toward the end of “Oh Love That Will Not Let Me Go,” horns and string swell, as if taking a deep breath in and then out. Ambient noise plays in the background and eventually it gets loud and powerful, but stays minimal in terms of notes and chords. When on my road trip, I thought about the idea of post rock being a soundtrack. But instead of a soundtrack for a movie or TV show, it can act as a sound track to your thoughts (if that’s not too corny). If you ever need to think things over, take a long car ride with this album and let it help you figure out what you need to figure out. Verdict: Yes, listen to this album on a long car ride. Waiting to get my tires changed. I’ve had a lot of bad ideas in my life, but trying to listen to Misery and Pride while waiting to get my tires changed was one of the worst. To start, there were people coming in and going out constantly, which is what you want if you’re a business, but not what you want when you are trying to focus on soft music. This was a huge distraction and I often found myself barely listening to the album because I was focused on everyone walking around. Then there was also the noise, which wasn’t so much electric drills and other sounds you’d expect from an auto shop as it was people sitting next to me talking loudly to the person sitting next to them. Between that and employees talking to customers, the whole thing was a noisy mess. Verdict: Do not listen to this album while waiting to get your tires changed. The point I’m trying to make is that Misery and Pride isn’t the easiest album to listen to. It’s tranquil, even dead silent at times, and it requires focused attention. But that doesn’t mean it’s not worth it. In fact, if you get in the right headspace and physical setting, you might find something truly meaningful in Misery and Pride.